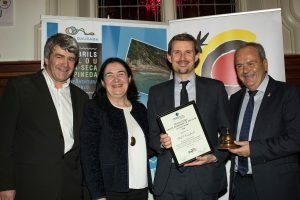 Pól Ó Conghaile was presented with the Travel Extra Travel Journalist of the Year Award at a ceremony held to coincide with the annual Holiday World Show, which took place at the RDS Simmonscourt last weekend. 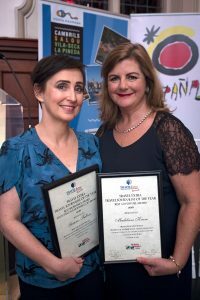 Nine other winners, each for different holidaying categories, were announced on Friday night at a dinner in Thomas Prior House, Ballsbridge which was attended by the cream of Irish travel and tourism writers and broadcasters. The event was sponsored by the Spanish Tourism Office and Costa Daurada. The award winners were chosen by a distinguished panel of senior Irish journalists. This year saw a huge increase in the number of submissions from previous years, displaying the creativity and continuing innovation of travel and tourism journalism in Ireland. The Holiday World Show at the RDS is an annual event running until Sunday 27th January, which attracts 40,000 visitors. Members of the public can avail of expert advice from over 1,000 travel professionals to find a holiday to suit any budget.